John Bonham Would Be So Proud! If legendary Led Zeppelin drummer John Bonham were alive today, I think he would be rendered speechless to see the lasting impact he’s made on the world of drumming. In such a short amount of time, Bonham was able to completely reshape the way most modern rock drummers approach the drum kit. He had a style, charisma, and conviction when playing the drummers that basically set the tone for almost all rock drummers to come. If you were to look at almost every hard rock band out there today and listen very carefully to the drummer, you’ll hear aspects of Bonham’s playing throughout. And what’s even more is that if you were to go online and look up Led Zeppelin drum covers, you’ll see and hear that these drummers have made it a priority to capture Bonham’s prolific playing style. Now, in all fairness, some of those covers are good, and some not so much, but there are very few that will blow you away like this one. 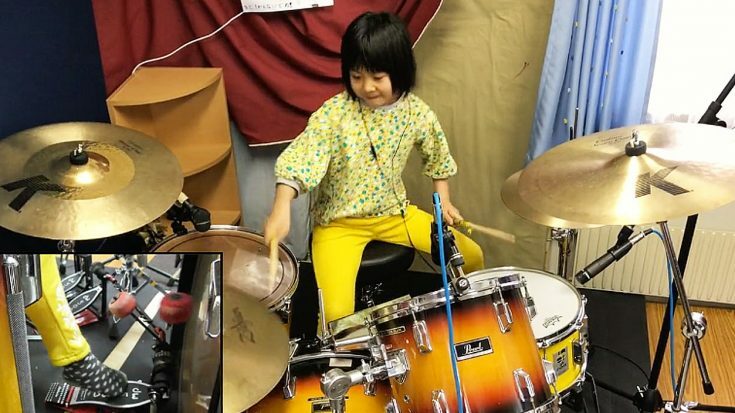 What you’re about to watch is a video in which an 8-year-old girl takes to her drum kit to perform a shockingly good cover of Led Zeppelin’s “Good Times, Bad Times”. Simply put, never judge a book by its cover, because the chops that this girl has are incredible. John Bonham himself would be so proud. Have a look!